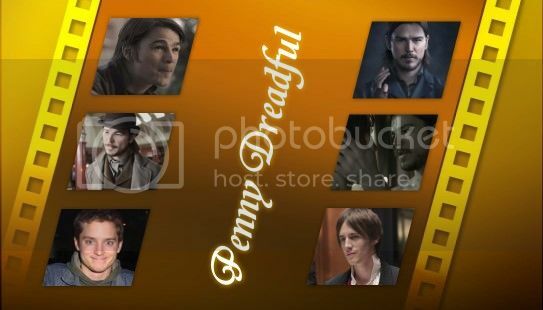 I know, it's laaaate (at least here in Germany the sunday is almost over) but still Cazekiel-Day ;) So here is the naxt chapter of 'Penny dreadful' - have fun with the boys. About three weeks later. Casey was standing on a ladder, a paper-hat on his head, a paint roller in his hand. He was busy with painting his bedroom in a bright yellow. The radio was playing jazz-music in the background He was still not used to the silence in his apartment since John finally did move out. Not that he missed him. It had ended with an annoying fight. When he was coming back from San Diego, one week later than planned, John was still there, waiting for him with questions and accusations. Even if this assumption wasn't that wrong, it was enough. Casey looked at him stressed out. John took a deep breath, narrowed his eyes. “Don't call it love,” he murmured. This made Casey speechless. He had always known that John was a homebody and this was one of the reasons why he had felt attracted by him at the beginning. Their evenings in front of the fireplace, chatting, listening to music. John had made dinner for them, not fast-food, he was a gifted cook. Good times. Before John started to turn more and more into a control-freak. “And what next,” Casey finally asked. Casey knew him well enough to realize that he did mean it. He sighed and shook the head. The guy had looked more annoyed than hurt when he had stuffed some clothes into a travel bag and left the apartment without more argument. Some days later, when Casey did come home from work, half of the furniture was gone, the keys were placed on the kitchen bar without a word. He was still fuming with anger when the phone rang and Zeke brought him back on earth again. Zeke. They would never have arguments like this. They were mature enough to know that a relationship between them could only work when they were willing to accept that they couldn't live together like other couples. Casey had his apartment and his job in Herrington. Zeke was living in New York, when he was not somewhere else in the world for a movie shooting, promotion or whatever stuff. It didn't matter at all. They just needed to make the most out of the given time. Like they had done in San Diego. Casey dipped the brush into the paint bucket and smiled while his mind wandered back. Of course, the kiss had just been the beginning. They had spent the night together, they had fucked wild, not once, not twice. It was as if they wanted to make up for all the time they had missed. Finally they dozed off, sated and tired, but happy, Casey's head on Zeke's shoulder. And in the early morning they made love again, more slowly and gentle this time. Last day of Con. At night they went into a club … together with Reeve and his girlfriend, a young actress, smart and pretty, and Reeve was obviously totally devoted to her. Zeke secretly grabbed for Casey's hand and chuckled slightly. “Shut up,” Casey said but laughed anyway. Zeke bend near to his ear, Casey could feel his warm breath and his wet lips. “Behave,” Casey murmured while the heat was rushing into his body. Gently Zeke nibbled at his earlobe. Finally Casey managed to pull away. “God, I hate you,” he groaned. Zeke laughed … and only one hour later Casey was more than willing to forgive him everything. One week. They did spend one more week in San Diego, enjoyed many hours at the beach, visited the Museum of Art and the Zoo, did all what happy couples did during their vacation. And when Casey took Zeke to the airport at the end of the week he told himself that there was no reason to feel depressed. This was not a good-bye. Everything was like it should be. Zeke needed to go back to New York where already a first script for the next Season of Penny Dreadful would wait for him. In two weeks he was on his way to Ireland for the shooting. But they would meet again, at the latest in November, when Zeke would be back in New York and Casey would go to visit him for some days. No, it didn't matter at all that they couldn't be together all the time, even better would the reunion be. Ready. Satisfied Casey put the brush aside and eyed the wall in front of him. So much better than the plain white walls. The two colorful prints of owls he did find on the flea-market last weekend would look great there. Well, I guess there was a time where John has had his chance but he didn't know to use it. They started to drift apart even before Zeke was back in Casey's life. But we don't mind, right, because we all want to see our boys together ... hmmm ... more in the next chapter which I finally managed to post. You just summed up my whole fandom approach, right there. Thanks for reading. We will see what will happen next .... is Casey able to deal with the distance between him and Zeke? And what is Zeke thinking about their relationship?